The most critical part of our life’s existence is the clean water we drink, use and enjoy on a daily basis. Water within a watershed is connected and recycled through a process called the water cycle. 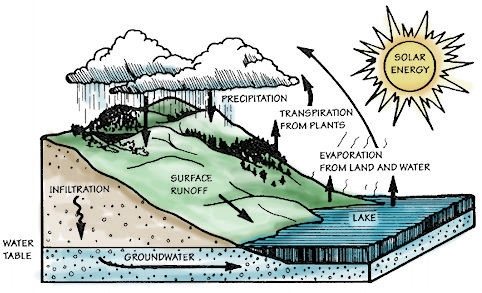 The water or hydrologic cycle represents the constant movement of water from the earth’s surface infiltrating through the soil into the groundwater, resurfacing to streams, and evaporating in the atmosphere and back again. In the process, water becomes a force of change as it erodes and carries various materials along with it. Pollution can enter this water movement at any stage of the water cycle through many routes including air pollution, surface runoff, or groundwater contamination. 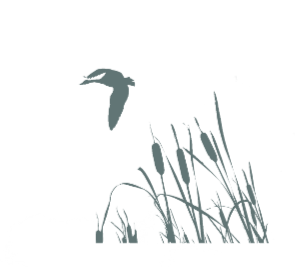 In Pike County watersheds, water pollution commonly takes the form of sedimentation from soil erosion, septic tank leachate, lawn fertilizers and pesticides, road salt, motor oil and other petroleum products and stormwater runoff. Any one of these many different sources of contamination can, by itself, be a threat to water quality within the watershed. However, the cumulative effect of different sources of contamination, also know as non-point source pollution, can have a much greater negative impact on surface or groundwater (drinking water) supplies within a watershed. Protection and prevention of water resources prior to contamination is always less expensive than cleanup after pollution has entered the cycle. The key to protecting water quality begins with a basic understanding of the water cycle and a watershed.